Factorie is a global youth fashion brand, where we remix the everyday to offer accessible street and casual fashion for girls and guys. We foster a culture of creativity, individuality and freedom of expression. Our mission is to deliver new, accessible and on- trend products made for the restless generation. We know our customers keep it real with their own sense of style, they are at the center of everything we do. 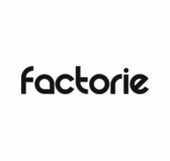 Factorie is committed to making a positive change around the world and within our community through empowering youth..
Factorie joined the Cotton On Group in 2007 and has grown internationally to over 170 stores across Australia, New Zealand, South Africa, Singapore, and Malaysia.